Yes. It’s true. The Southwest Train ticket machines have finally gone contactless, and only a decade after I first used an NFC phone to pay for something I was able to use an NFC phone to buy a ticket in the machine at Woking station. Now, let’s be clear. Woking is no stranger to contactless. Within the town boundaries, a wallet is an unnecessary accoutrement. I suppose some people might want to use cash, cheques or cards for cultural reasons, much as hipsters insist on using vinyl records, but they no longer need to. Indeed, only yesterday when my good lady wife asked me to pop to the shop to pick up a few baking essentials, I jumped on my bike and set off, never giving a thought to wallets or wads. I had my phone set to Planet Money and that was all I needed. On the few and far-between days when I am working at our office in Guildford I don’t need a wallet. When I’m working at home I don’t need a wallet. But when I am working in London I do. Or at least, I did. The two hurdles to handset happiness were Arriva buses and Southwest Trains. But a couple of years ago, Arriva launched their mobile app so I don’t need cash for the buses any more. The only remaining barrier was Southwest Trains. But it’s all different now. 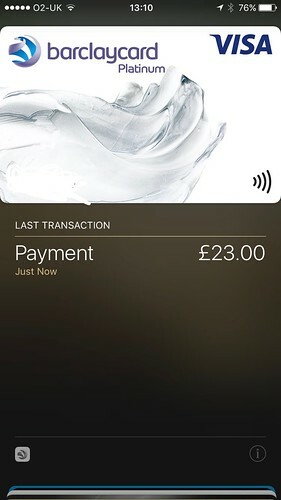 I bought my train ticket with Apple Pay for the first time today. In Woking station, if nowhere else, it was #cardmageddon. What? Don’t Southwest Trains have a smartcard you say? Well yes, they do. But you can’t use it to buy tickets online. You have to go to the station and tap it on the ticket machine and then put in your payment card and then tap it again so it’s hardly worth bothering, especially since I need to press the receipt button and wait for a paper receipt anyway. May 2017 will be as famous as a September 1958 (the Fresno Drop) in the history of the inexorable march to cashlessness. For this is when I went down to Woking station, after a couple of weeks’ globe trotting, to discover that everything had changed. I am living in a new world. 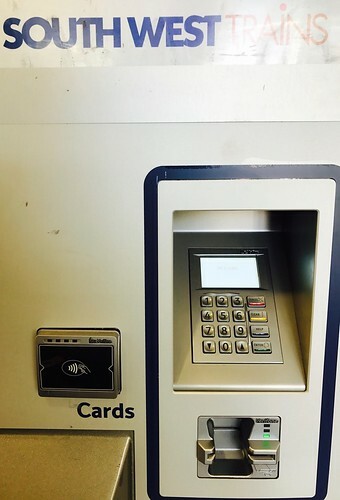 The ticket machines at Woking station now have contactless! I can now leave my wallet at home for good! ← Cards vs non-cards or cards and non-cards?